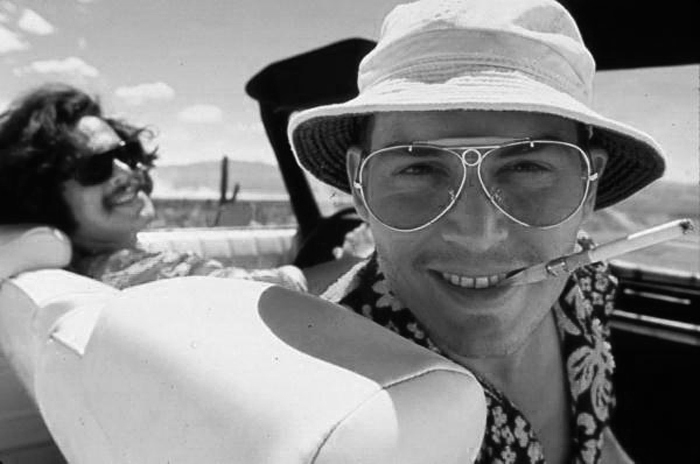 Raoul Duke | Auggie's Diner "Style"
Fear and Loathing in Las Vegas is a 1998 film adaptation of Hunter S. Thompson's 1971 novel Fear and Loathing in Las Vegas: A Savage Journey to the Heart of the American Dream. The film, directed by Terry Gilliam, stars Johnny Depp as Raoul Duke and Benicio del Toro as Dr. Gonzo. Previous attempts to adapt the book into a film included Jack Nicholson and Marlon Brando as Duke and Gonzo. At one point, Dan Aykroyd and John Belushi were considered for the duo; John Cusack was also almost cast. Animator/filmmaker Ralph Bakshi, Martin Scorsese, and Oliver Stone all tried unsuccessfully to direct an adaptation. Thompson met Depp and was convinced no one else could play him. Filmmaker Alex Cox was eventually hired to direct with Depp and Del Toro committed to starring in the film, but the filmmaker had "creative differences" with Thompson over the script treatment as documented in the documentary Breakfast with Hunter. Gilliam was subsequently hired and made the film with the writer's approval.